Beer fests test human mettle. It’s a lot to ask of the body to filter several gallons of beer in just a few hours. Spending my formative years in Milwaukee gave me a paraffin-lined liver, but I still get emo after 4.2 hours of drinking. Therefore, getting through the California Festival of Beers and its 50-brewery lineup requires strategy, resolve, and a cell phone stashed safely away. 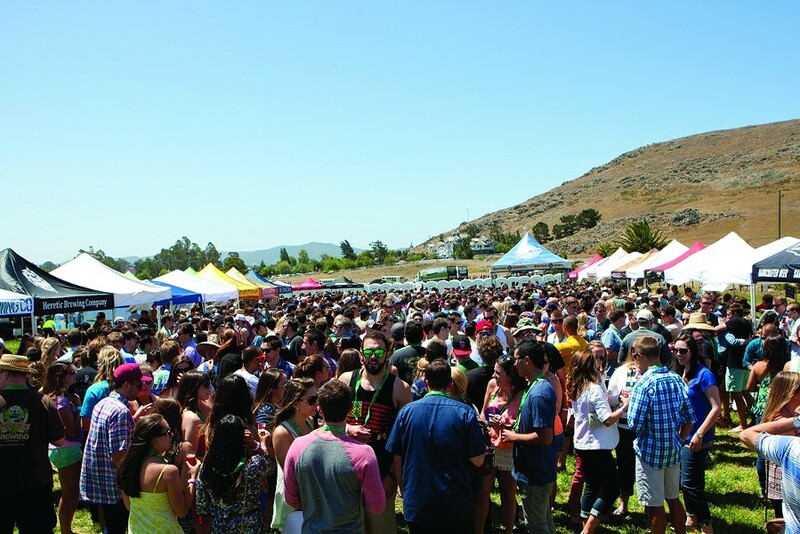 BEER GARDEN : The California Festival of Beers gathered more than 50 breweries to the Madonna Meadows May 24 to 25 to raise money for Hospice SLO. 10:30: The festival organizers delay the start of the VIP pouring, blaming it on the fire marshal. In six years of reporting, I’ve never met a fire marshal—not really sure they exist—and, in any event, it’s a likely story when one delays the start of an event. I extinguish my mild frustration with Green Flash’s Highway 78, a fine imperial Belgian aged in scotch barrels. 11:00: The gates open and several dozen Chads charge onto the Madonna Meadows screaming something unintelligible. The Dollies saunter quietly behind. The mob heads to the northeast corner, so I go southwest for a glass of Dunbar imperial red. First rate. 11:30: I make the first of several trips to Figueroa Mountain, where brewer A.J. Stoll pours six beers trucked up from Buellton—one of the better local showings. I hoped to find some limited releases on tap at nearby Firestone, but their fest selection could be replicated with a trip to the Campus Bottle. 805 Ale may prove to be the ultimate success story in local craft brewing, but it’s about as interesting to me as a Cal Poly frat party. Noon: All sections of the grounds now thoroughly populated, I can’t help but notice they stuck the Blue Moon tent downwind of four ranch horses. It still boasts the longest line at the festival. I’ll never understand who pays $80 a ticket to drink beer made by Coors and sold at Costco for $15 a case. 12:30: Einhorn’s Doug Martin pours some of that stellar doppelbock as a sickly-sweet odor wafts over from the cattycorner Boss Cigars Lounge. I thought it was illegal to smoke anything in SLO but marijuana. 13:15: Ran into Milwaukee brewer (lower case) Randy Sprecher, whom I first met a decade ago. He informs me Miller ran his product out of the Brew City festival circuit several years back. One more reason not to go home this summer, joining mosquitoes, humidity, and the Milwaukee Brewers (upper case). 13:45: A huge crowd gathers around the Shock Top tent. The Anheuser-Busch subsidiary promotes its new Campfire ale by serving samples in s’more cups and handing out Mardi Gras-themed swag. I insist on trying Campfire in regular glass. It reminds me of camping, particularly that time I accidentally swallowed DEET. 14:15: Creekside showcases an enjoyable light ale fermented with a yeast strain purportedly millions of years old, yet it was their ham-fisted coffee stout that broke out of its paddock and ran amok after Dennis Nedry shut down the perimeter fence. Please inter the remaining barrels on a Costa Rican island, and make more barleywine. 14:50: Increasingly disillusioned with the Obama administration, I reach for a Hangar 24 double IPA, followed by a Goose Island saison and a Sierra Nevada Bigfoot. Existentialism follows.